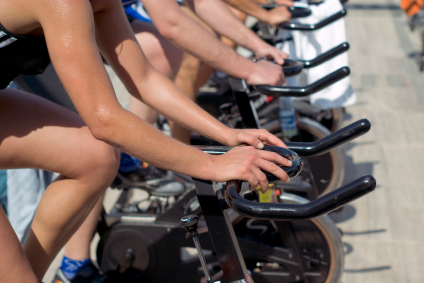 Cycling workouts in North Attleboro, MA let you spin your way to physical fitness. Because there are no complicated moves to learn and master, this type of cardiovascular exercise has been growing in popularity as a fun and engaging indoor group exercise class. In group cycling classes certified instructors take charge of the classes in order to ensure that everyone is exercising safely and correctly while having fun. Cardio workouts have never been as convenient as indoor cycling workouts. This indoor option means that you have no excuse not to exercise and work your way to a healthier and happier life. The certified instructors also make sure that you will be performing a full-body workout with music that begs your legs to pedal. In return your specific fitness goals will become a reality. These cycling workouts are performed in a group exercise class which stimulates motivation as you work out with your fellow fitness enthusiasts who also want to burn extra calories, lose weight, and get in shape. Choosing cycling workouts keeps your heart healthy and results in a wide spectrum of fitness and health benefits. In particular, cycling enhances balance, endurance, and flexibility which you need in order to perform your daily tasks and household chores. To find out more about the expansive group exercise schedules we offer, contact Answer is Fitness.